When shopping for a new TV, one of the most common mistakes people make is to buy the wrong sized one or the wrong combination of size and resolution and then regret it. To avoid going through the frustrating process of returning a TV, or through serious buyer’s remorse, here are some tips on choosing the best-sized TV for your needs and for your room. The first rule of the thumb is to pick the largest possible size which your room size, seating and viewing distance, and of course your budget can fit. This is because the larger the screen – the more immersive your viewing experience will be. First and foremost, you need to remember that the size of the TVs is measured diagonally, which means that a 55 inch TV will be 52 inches from one corner to the opposite one. Then, consider the resolution of the TV, because the higher your TV resolution is – the closer you will be able to sit without having to deal with the annoying pixelation of the images on the screen. In general, this means that you can sit closer to a 4K TV than you can to a Full HD TV of the same size. This means that you can get a smaller sized 4K TV which will still fill your viewing field rather than a larger 1080p one for the same seating position. The recommended position to view your TV from depends on the resolution and size of the TV. If you want to enjoy the extra details on your 4K TV, you may want to sit a tad closer, at about one or one and a half times the size of your TV’s screen. Keep in mind that the picture of a 4K TV can have four times as much detail at that of a Full HD TV of the same size. But in order to actually see this difference and appreciate the details, you have to opt for a set which is 40 inches or larger. Also, you can sit closer to an Ultra HD TV because the pixels are much smaller and harder to notice that on a Full HD screen. If you sit too close to a TV you may be distracted by the pixelation, but if you are too far away, you may be missing out on those details we have been talking about. So, make sure to follow the above guidelines in the tables, and measure your seating settings and your room size in order to find the most suitably sized TV for your specific interior space, as well as for your preferences of course. If you have a very large room or you are planning on watching TV at a larger distance than those given above, you should opt for a 4K TV which has High Dynamic Range (HDR) support, because it will improve the contrast as well as the color range of any HDR content, which are both more noticeable and can be seen from farther away. Of course, your room size and the furniture in it are also essential for choosing the most appropriately sized TV. There can be some flexibility in the size choice if you are willing to play around and move around some of the furniture in the room. You also need to consider whether you are planning to use the TV stand or you want to mount your TV to the wall, in order to make the right choice about its size. If you are going to use the stand, keep in mind that this will set the TV closer to the seating, and thus shorten the viewing distance. So, measure the footprint of the stand and especially take into account its depth, in order to calculate what the viewing distance will be. Some TVs come with narrower stands, but others have quite a large footprint and can extend to up to a foot behind the actual screen. If you decide to hand the TV on the wall via a mount can add more than one foot to the viewing distance, depending on the thickness of the TV and the type of mount you are planning on using. Normally the visual system of humans has a horizontal viewing angle of about 135 degrees, so for watching movies or content which is made to fill the entire field of vision a large TV is a better choice. But for watching other content on a large TV from a close distance can be quite uncomfortable, such as trying to focus on a single area of the screen like when watching sports. According to THX, a viewing angle of about 40 degrees is the perfect one for an immersive viewing experience. To calculate this angle just divide the distance from your seating to the place where the TV will stand or hang in inches by 1.56, which will result in the recommended screen size for your specific setting. So, if you sit at a distance of 9 feet, the recommended screen diagonal is about 90 inches. But this size could be a tad too big for most people, so it is better to opt for a set which is about 60 inches if you don’t want to be overwhelmed by your new TV. The recommendation for by THX for Ultra HD TVs is to divide the viewing distance by 0.78 to 1.00 for the ultimate best size of your 4K TV, and which once again confirms that Ultra HD TVs are much better for viewing from a closer distance, and thus can be more suitable for narrow or small rooms. The Society of Motion Picture & Television Engineers (SMPTE) recommends a 30-degree FOV angle, which means dividing the distance in inches by 1.6, which will result in a relatively smaller diagonal. In the abovementioned case, the recommended size for the TV would be 68 inches, which means that either a 65 or a 70 inch one will work. According to CNET, the best field of view angle is the distance between the seating and the TV multiplies by 0.667, which results in a screen size of 72 inches for the 9ft distance setting. So, you can use some of these guidelines in order to get a clearer idea of the size you should be looking for when you go out shopping for a new TV. Overall, we can conclude that the TV should be large enough and close enough to fill a particular amount of your field of view, but what this amount is actually depends on you and your personal preferences, and whether you are going to use the TV for watching movies, or you need it for mixed use. Once again, do take into consideration not only the screen’s diagonal measurement, but also the actual dimensions of the TV, and the footprint of its stand when you are choosing the best one for your specific settings. If you will be mounting it to the wall, check out the TV’s depth and its height as well. If you will be placing the TV in a cabinet or another limited space, check out its actual width with the bezels too and not just the screen size, in order to ensure that it will fit the allocated space. If you want to get a true feeling of how the TV of your choice will fit a specific space, you can cut out a cardboard mockup with the actual dimensions of the TV or use painters tape to outline the TV on your wall. The height of the TV is important as it determines the perception of size, so check the height as well. 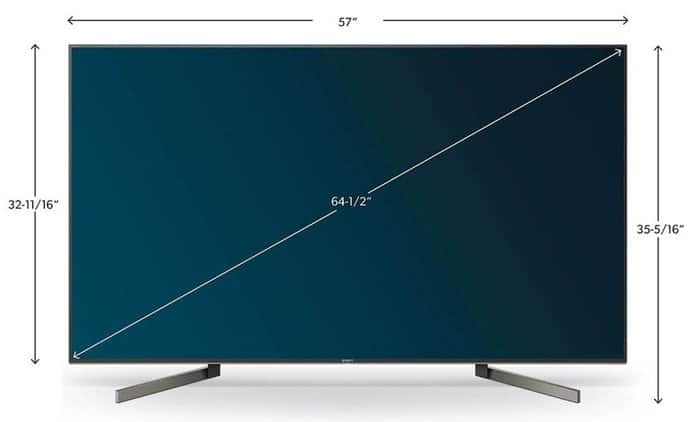 Always check out all of the dimensions of the TV you are planning to buy and make all the measurements at home before buying one and realizing that it is too large or too small for the space you have available for it. The different brands and models differ in overall width and height but typically you can expect a 55 inch TV to be 48.5 inches wide and 28 inches high, a 65 inch TV to be 75 inches wide and 33 inches high and a 75 inch one to have a width of 66 inches and a height of 38 inches. Also, if you are going to use a sound bar in front of your TV make sure you calculate the difference between its height with the stand so that you don’t get a sound bar which is higher than that and which will block your view or your remote control connectivity. Some tech experts recommend that if you want to buy a Full HD TV, you should choose a size which is 1.5 – 2.5 times the screen size. According to the retail giant Amazon, you should measure the seating distance in feet and multiply it by 7.7. This means that for a comfortable as well as an immersive viewing experience you should buy a 42 inch Full HD TV if you will be viewing it from 7 feet away. To be on the safe side, you can simply split the difference and double the screen size. So if your seating is 10 feet away from where you are planning on setting up your TV, you should divide 120 inches in 2, which results in a 1080p TV screen size of 60 inches. If you are opting for a 4K resolution TV, then you should change the formula a bit by decreasing the viewing distance to 1.5 times the screen size. This means that you will be most comfortable viewing a 50 inch 4K TV if you are sitting 50-75 inches away from it. Whatever type and size TV you choose, the best positioning is at eye level and straight ahead of the viewing position. If you have wide seating, a narrow room, or a large group of people who will be watching, you may want to opt for a TV which has a wider viewing angle, such as an OLED TV which can be viewed without any distortion of the color or contrast for just about any part of the room. If your TV will be positioned right in front of you, then you can opt for a LED LCD TV, and for on-axis viewing an LCD TV is probably the best choice. Of course, if you want you can opt for a full-motion wall mount or an adjustable stand so that you can turn it towards the viewers who are off-axis whenever necessary, and then push it back to a normal front-facing position. This is the number of pixels on the screen per angle which will increase as you increase the distance between you and your TV. Ever since Full HD TVs were introduced, a higher field of view was made possible. Today with the advent of 4K TVs this ability is being enhanced even further. Even if you are watching a high-resolution source on your 1080p TV if you are too close to the screen you may get the feeling like you are watching it through a screen door. Once you move back and increase the distance, the density of the details will increase as well and will result in a better picture. With 4K Ultra HD TVs which have a much larger pixel density, such an issue is more difficult to arise if you are watching it at a very close distance. So, here are the recommended viewing distances in accordance with the TV size as well as the resolution of the TV. This angular resolution is useful for determining the minimal distance of viewing before reaching its resolution limitation. In order to make the most of your new TV’s resolution, you should be exactly on the line where the media resolution and the TV size intercross. Naturally, how far away you can sit from your TV also depends on your vision. According to experts, people with perfect vision are able to distinguish something 1/60 of a degree, which is equal to 60 pixels per degree and a 32 degree for Full HD TVs, and a double of 64 degrees for Ultra HD (4K) TVs. Can a TV be too big? While almost all experts agree that bigger is better when it comes to TVs, there are cases when a TV can be too big for a specific room or seating position. This can happen when you are watching lower resolution content which can become literally unwatchable if you are too close to an extremely large TV with a high resolution. Also, if the TV is so big that you can see the pixels and other details which you are not supposed to see, your viewing experience can be seriously affected. Also, if you get a very large TV which takes up most of the room, it can actually begin to dominate the room, and you may have to remove other items and accommodate the rest of the living space to fit the TV, which can be quite a hassle. What about the lighting in the room? The ambient light in a room can have a serious impact on the picture of your TV. Both the sunlight and the lamps indoors can affect the viewing experience in a positive or negative aspect. A dim light which is not directly across the TV and isn’t reflected on it can help reduce the straining of your eyes and can help you enjoy deeper blacks on your TV screen. If you have too much light, it can cause a glare on the screen and will cause the colors to look more washed out and faded. If you have concerns about glare, you may want to opt for a LED LCD TV which generally have anti-reflective and bright screens and are better options for bright light and for well-lit rooms. You can control the lighting of your room by installing dimmers on your lamps and adjusting the brightness of the light in accordance with your needs when you are watching TV. If you have large bright windows or French doors, make sure you don’t place your TV directly across them, or you can use curtains or shades to block the direct sunlight for a better viewing experience. But a completely dark room can cause strain to your eyes when you are watching TV, so avoid watching your favorite movie or show in total darkness. Always make sure that your TV stand, table or wall mount is accommodated to carry the weight and size of your TV. Also, make sure that the TV is properly placed on the stand and that all of its sides are equally balanced, to avoid it toppling off of the stand. If your existing TV stand or table is relatively short, pick a TV which has a single central stand, rather than one which has feet on both ends, so that it can fit properly on it. Wall mounting is strongly recommended if you have toddlers or small children at home if you want to avoid them accidentally pushing over the TV from the stand and damaging it and injuring themselves. You can secure the TV to the stand or table via a safety strap as well. So, how do you choose the best screen size? After all of the complicated calculations and statistics, we can conclude that the choice of the size of your TV largely depends on several factors – its resolution, the size of your room as well as on your budget. Smaller screens are perfect for kitchens, bathrooms, and studies. Today as the market is shifting towards 4K resolution, the HD resolutions are mainly reserved for these smaller TVs, which makes sense because you cannot really see the difference in the resolution on such a small screen. If you have a tight space, and you are looking for a second or third TV, you should opt for a screen which will comfortably fit the space. As for the main TV of the house, you may want to start considering larger screen sizes. Based on the budget you have planned for your TV, you can determine which is the largest size you can afford at the resolution you want. So, plan your budget first and then think about the rest when you are choosing a new TV! For those on a tight budget, there are various large screened HD TVs at very reasonable prices. A Full HD 1080p TV is suitable for those looking for a gaming TV, for watching streaming services or Blu-ray disks, or regular cable, terrestrial and satellite broadcasts. The 4K Ultra HD TVs have a four times higher resolution than Full HD TVs. This allows you to sit closer without getting distracted by pixels or other details you are not meant to see on the screen. It is the future-proof option if you are looking into making a long-term investment and is perfect for enjoying Ultra HD content as well as lower resolution content too. We recommend that you follow the SMPTE recommendations by for a 30-degree field of view if you are looking for a TV which you will use for movies, games, sports, and other mixed usage. We also recommend that you invest in a 4K TV, because they have the best of the latest features such as HDR, which the Full HD TVs lack. So, to get an idea of the perfect size of your future TV, just divide the viewing distance in inches from the seating to the TV by 1.6 to get the size you need. In case the suggested size is out of your budget, then get the closest one which you can afford. If you are shopping for the main TV for your living room, we would recommend that you start from a size 50 and up, unless you have a very limited space. There are some excellent and very reasonably priced TVs in the 50, 55-inch range. Of course, if you can afford it, and have space, you may want to opt for an ultra large TV of over 75 – 80 inches. If the space is narrow and the viewing distance is short, opt for an Ultra HD resolution for the best viewing experience. So, get those measuring tapes and calculators out, and start picking the best-sized TV for your needs. Good luck with your choice, and we hope you are happy with your pick!